In our video series we follow a visitor to Athboy in May 1916 as they go about trying to find out more about their grandfather while at the same time learning about the town itself. Here you can read more on some of the people and places mentioned in the videos. The weekly market was held on Thursdays. The Market House had an official weigher for the weighing of grain, potatoes and vegetables. Wool was also sold here when in season. Built in 1885 the National School was the primary school in the area until it was closed in 1949. It was then purchased by the Mercy Order who operated a secondary school there for another 13 years. It is currently a furniture shop. The Kent based Earls of Darnley were the landowners of Athboy from the 18th to the early 20th century. The Darnley Estate owned all but six of the townlands in the parish of Athboy and Rathmore. They were, mainly, absentee landlords leaving the running of their Irish estate in the hands of various Land Agents. 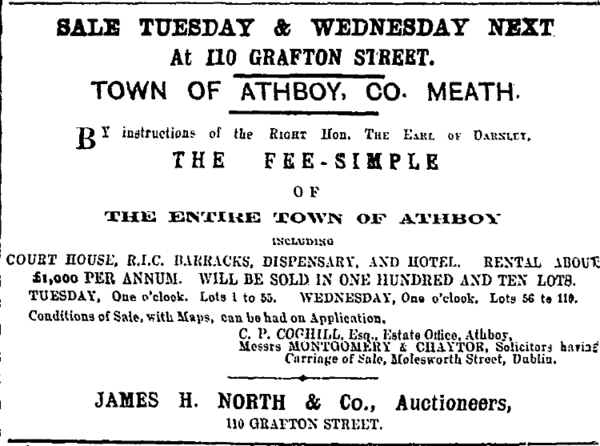 The town of Athboy was put up for public auction by Ivo Bligh, 8th Earl of Darnley in 1909. Between the 15-16 June 1909 the ground rents of the town of Athboy were sold at JH North & Co. Auction House on Grafton Street in Dublin. The townspeople, having formed their own branch of the Town Tenant’s League managed to secure ownership of their own homes. 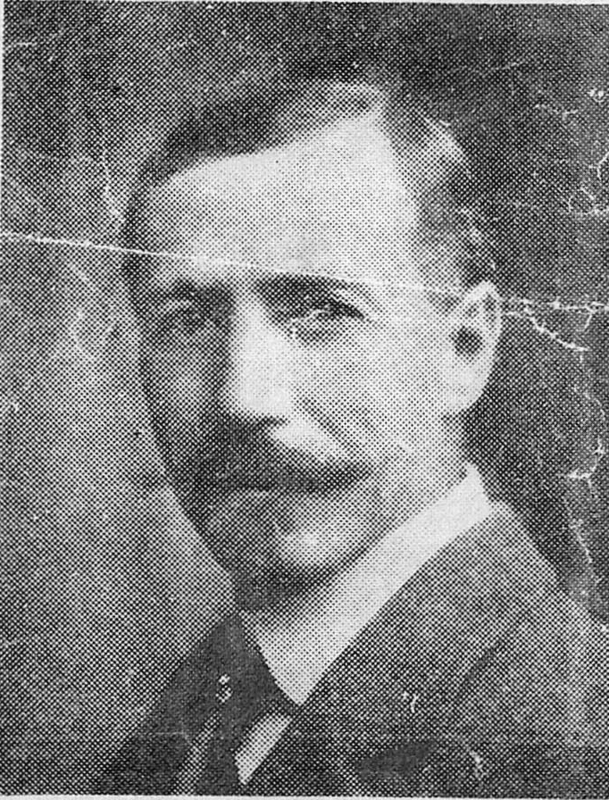 John Morgan Mordecai Jones was born in Wales in 1865. He inherited, and continued to expand, a vast wealth from his coal mining family. As a young man he went on several bear hunting expeditions to the wild American North West and Alaska. On one such trip he met Sonatic Koniste who became his faithful manservant. In 1910 Mordecai Jones purchased Clifton Lodge estate 2 miles from Athboy, and moved there with his family and manservant. Mordecai Jones died at Clifton in 1913 and was buried in Athboy. James Crummey was born in Connor Street (sic) Athboy in August 1897. His father, also James, was a labourer and had married Annie Lee, also of Connor Street (sic) in Oct 1896. The family later acquired a small farm in Martinstown. 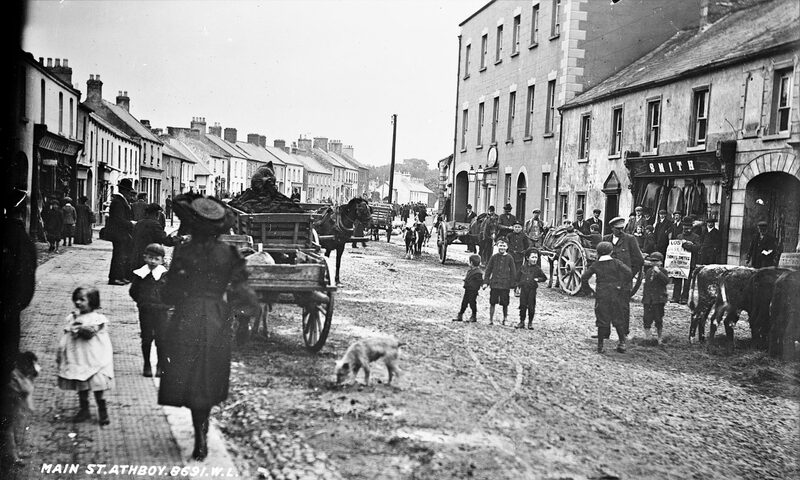 His grandmother, Mary Crummey, had a lodging house in Market Street, Athboy (probably just a spare room in her small thatched house which was rented out). Note: The name Crummey is incorrectly spelled in several records as “Cerumney” or “Crumney”. The young James joined the Royal Dublin Fusiliers and was killed in action in April 1916. Records state that he was 26 years old but he was in fact just over 18 when he died. It is therefore likely that he lied about his age in order to join the great adventure. He is commemorated in the Loos Memorial. Patrick Lynch, son of Mark Lynch and Eliza Ward, was born at Mitchelstown, Athboy, in 1893. Originally from the Raharney area, Mark acquired a small farm at Mitchelstown. The family home, a small thatched cottage, was located in the shadow of Rathcarne railway bridge on the present day site of Thomas Conneely’s farmyard. 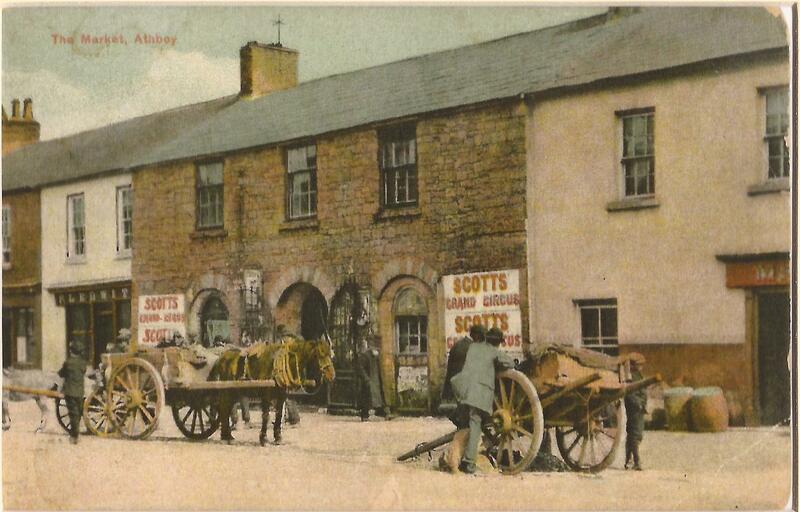 When Mark died in 1895 Eliza continued to run the farm and raised her 4 sons at Mitchelstown. Patrick worked as a groom in the nearby racing stables of Reggie Walker of Rathvale until he enlisted in The Irish Guards Regiment in 1914. He was posted to France in Aug 1914 and was killed in action just 2 months later. His body was never recovered from the battlefield. He is commemorated in the Menin Gate Memorial at Ypres. Thomas Coleman, the youngest son of Mary Coleman, the area District Nurse and Midwife, lived at Bridge Street, Athboy. He enrolled in the Athboy National School in 1900 at age 6 years. At the outbreak of WW1 he joined the Leinster Regiment and was posted to the French war front. He was killed in action on 10th October 1914 at just 20 years old. 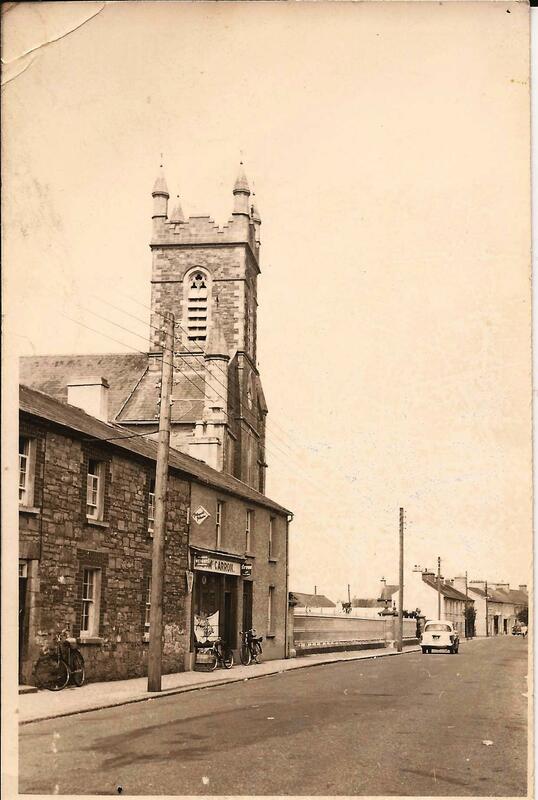 The Courthouse has been Athboy Macra Hall since the 1960s. Constructed in 1864 Courthouse played host to the Petty Sessions. 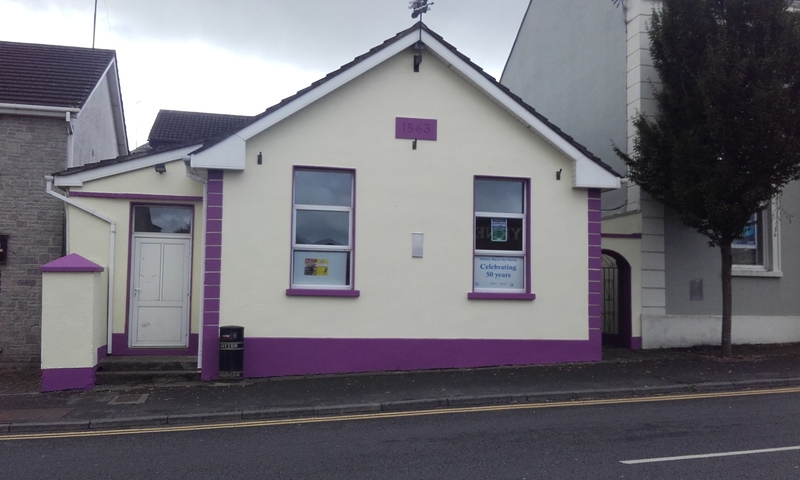 In 1964 it became the hall for the local branch of Macra na Feirme which it has been ever since. 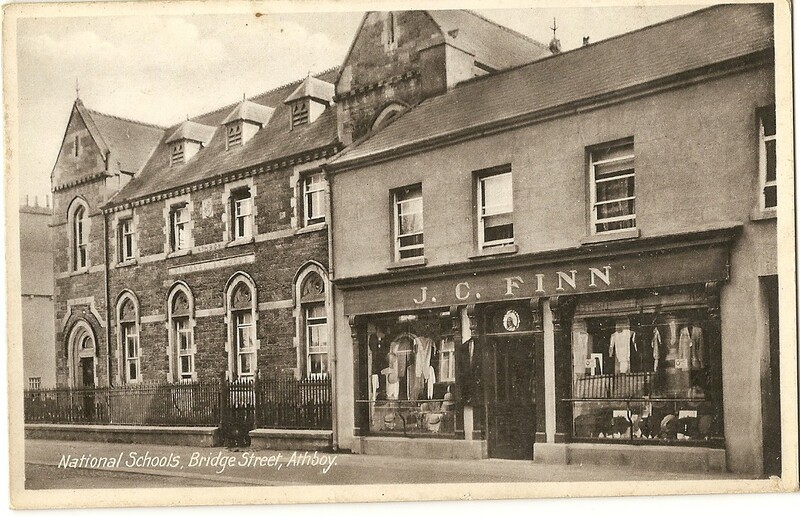 The Barracks which was located next door became the Athboy branch of Bank of Ireland. This Church was erected in 1772 on the site of a previous Norman church. 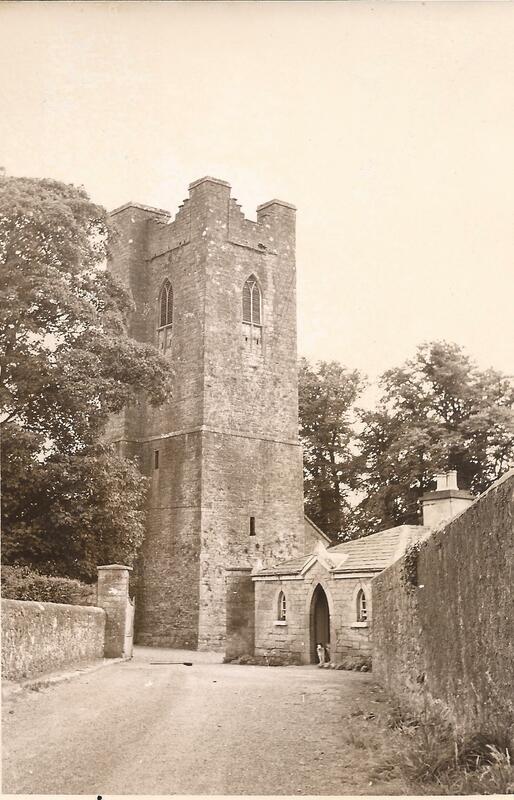 The tower, however, belonged to a previous church built by Carmelites. Part of the wall around the current cemetary was once Athboy’s town wall built in the 11th century. Ion, Guy Travers and Felix Temple were the 3 sons of John Morgan Mordecai Jones. They came to live in Clifton Lodge, Athboy, which estate their father purchased in 1910. At the outbreak of war the 3 young men joined the Leinster Regiment. They were each Captains, but in different battalions. Ion was in the 5th Battalion Special Reserve, Guy Travers was in the Trench Mortar Battalion and Felix Temple first saw action in Salonika. The three brothers were probably never in the same place at the same time! Guy and Felix died in 1972 and 1973 respectively and are both buried in Washington State, USA. Ion lived in Dublin until his death in 1976 and is buried in St. James Cemetery, Athboy. Sanotic Koniste was born in Japan sometime towards the end of the 1800s. He traveled to the United States Pacific North West. On a trek through the wild high mountains of Washington State he was injured and left abandoned by his traveling companions along a mountain pass. He was rescued from certain death by John Morgan Mordecai Jones and as a result “The Jap” became the faithful traveling companion and manservant of Mordecai Jones. They took up residence in Clifton Lodge Estate, Athboy, in 1910. Completed in 1843 whilst Ireland was in the midst of the Great Famine. St. James Roman Catholic Church was built on bogland and it’s foundations are supported by tree trunks which were sunk into the ground. Rev. Fr. James Rickard PP, who oversaw it’s construction, is buried inside the church. Rev Peter Kelly, a native of Rochford Bridge, was ordained to the Priesthood in 1898. He served in several parishes including Stamullen, Kilmessan, Trim and Turin before being appointed CC in Athboy in Sept 1909. He remained in Athboy for 7 years until he was transferred to Kildalkey in Oct 1916. He eventually became Parish Priest of Carnaross in 1919 where he ministered until his death in 1938 at the age of 66. Situated on the outskirts of the town the Hill of Ward (Tlachtgha) is the site of an Iron Age Ringfort linked to the Gaelic festival of Samhain (the forerunner of Halloween). In mythology it is associated with the druidess Tlachtgha who was said to have given birth to triplets on the hill. It obtained the name Hill of Ward after the English landowner who was evicted following Cromwell’s invasion of 1649. In recent times the UCD School of Archeology have conducted archaeological digs on the site.